Sampled Grand Piano with Karma! We have been sampling our vintage 1892 Bechstein grand piano out of the legacy of the armenian virtuoso Maria Kalamkarian and created a virtual instrument for NI Kontakt together with Pianowave. It incorporates 6 dynamic layers plus release-, sustain-, hammer- and alternating pedal-samples that are controlled by a highly efficient scripting logic in real time. The instrument reacts just as a real piano; stunts like repedalling are no problem. Thanks to our unique HBT (hybrid bit technology), perfectly looped late note tails and Pianowave’s proprietary voice management, this high-end library is compact enough for quick downloads and overflowing hard disks as well as “modest” enough for a solid performance even on weaker systems. The playing of this Kontakt instrument brings up a colorful and warm sound, that is despite its nice depth and ambience still direct enough to create a convincing “real piano playing” illusion. Our Kalamkarian Bechstein has an elegant timbre in the lower dynamics while being capable of turning into whipping thunder if you dig in hard – without getting muddy. Occasional “sloppy” notes represent this old lady and have not been banned to keep up the true charm of this instrument. 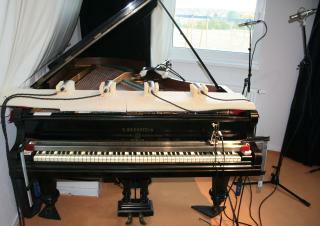 © Pianowave & UVASONAR Media Pool 2009. Produced by Stefan Kortner & Roman Beilharz. – Scripting and Main Editing: Stefan Kortner – Recording and Mastering: Roman Beilharz – Recording session player: Donato Deliano – Piano technician: Stephan Cobré.